Current Obsession: Loom Knitting | Finding delight. I was the happy receiver of a Martha Stewart Crafts Knit and Weave Loom Kit this Christmas and I’ve finally cracked it out. 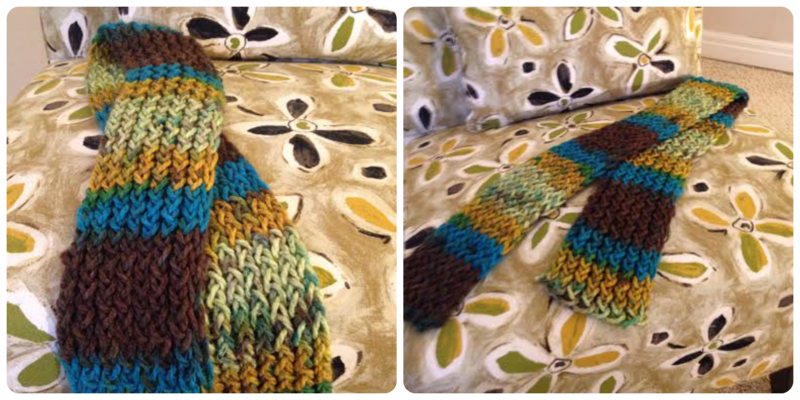 After making one scarf I am completely hooked (pun intended)! Like any good obsession, I’ve found myself looking up all sorts of new projects and watching tutorials on YouTube. I think the biggest appeal for me is the turn around on completion is quicker than regular knitting or crocheting and it’s a little more mindless so I can easily watch trashy reality TV while I’m working some yarn. As someone who loves to have busy hands, I really enjoy having a second activity available for when I’m watching TV, on the phone, or listening to podcasts. I would highly recommend this kit for anyone who would enjoy some quick weekend projects, whether they have experience with knitting/crocheting or not! This weekend, I kicked off a second scarf and am trying my hand at a hat. Being stuck indoors during this yucky winter weather has a few perks after all!